National Letting Go of Stuff Day is March 28, 2013. This day is dedicated to anyone who wants to begin letting go of stuff – inside and/or out. To celebrate the significance of this day, there will be a virtual page on FaceBook in which people are asked to like. The reason for the virtual event this year is to prepare for the big cruise event in 2014. According to Johnson there is a National Letting Go of Stuff Day Cruise planned for 2014; the details of which will be shared soon. The proceeds from the 2014 cruise will also go to support domestic violence survivors who thrive. Johnson founded the nationally recognized day in 2008. The day, as reported by Chase Calendars, is a day in which people can focus on what they want to let go in their life. It is about – thinking differently and being better. Its also a great way to measure personal “letting go progress” from one year to the next. Orpah Winfrey, Dr. Phil, Tyra Banks, the Wendy Williams Show, and so many others have touted personal development as one of the single most important factors for learning to love and forgive your self. The phrase “let go” has become almost a cliché that allows many to overlook the power of its application. Now there is a national day dedicated to letting go of stuff that supports making long lasting measurable changes from one year to the next. To learn more about National Letting Go of Stuff Day go to www.LettingGoCafe.com/National-Letting-Go-Of-Stuff-Day. National Letting Go of Stuff Day is the fourth Thursday in March. This day is dedicated to loving and forgiving oneself. In honor of this nationally recognized day, there will be an event held in Albuquerque, NM at Great Face and Body, located at 805 Silver Street, SW. The open to the public event is from 5:30 p.m. – 8:30 p.m. on March 24, 2011. 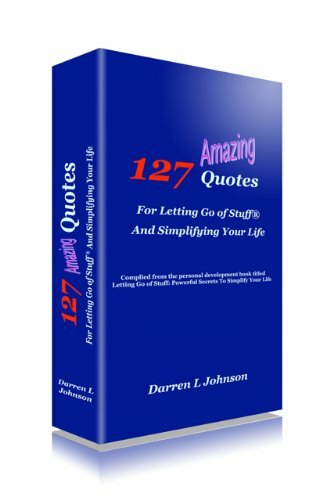 Darren L Johnson, founder of National Letting Go of Stuff Day says, “This day is really about focusing on who you are, and what you want to change. Its about – thinking differently and being better. Its also a great way to measure your personal development progress from one year to the next.” Oprah and others have touted personal development as the single most important factor for learning to let go of stuff, love and forgive your self. Now there is a national day dedicated to this notion. To learn more about National Letting Go of Stuff Day visit or email info@NationalLettingGoOfStuffDay.org. @Rusty. Thanks for dropping by the Letting Go Cafe. Your post, National Letting Go of Stuff Day Letting Go Cafe, is really well written and insightful. Glad I found your website, warm regards from Derick! Hello,I adore reading through your blog, I wanted to leave just a little comment to support you and wish you a great continuation. Wishing you the very best of luck for all your blogging efforts.